Hi. I have a Humax DTR T2000 and I've noticed this issue several times when attempting to watch a program that is still recording. I choose the recording from the list, it says it's already recording, I start to watch it and I actually join the program in real time and the beginning of the recording is lost. I saw someone else on this forum mention this issue but it didn't go anywhere. The issue seems to be intermittent. Sometimes I start watching and the whole recording remains intact. Can you let us know a the programme names and channels this has been happening with? It'd also be useful if you could confirm which software version you are using as well. If you're not sure how to find this, you can press Help and then the Info button and that will bring up the software version. If you still have the link to hand, can you link me to the other thread that mentioned this? I can't seem to find it myself. I've only noticed it with the Tour De France highlights program on ITV4, but that's the only program I would attempt to watch as it's still recording. I'll have a chat with the team here to see if it's something they've heard about before and get back to you once I have an update. Our team are currently investigating this issue however we have had a very limited number of reports of this so they will need to do some testing to see if they can replicate it. Might this issue be a manifestation of the ‘tardy streams/failed recordings’ issue? It is known that when a recording has failed to start in Standby on a Humax YouView box due to this issue, that when the user turns the box on, it suddenly realises it should be recording, and starts doing so. The above description is at least consistent with that as an explanation, so this may not actually be a separate problem. It's hard to say whether it could be linked without any testing however I'm sure it'll be an area they'll check in case there is a link between the two issues. Today did same thing, but made sure ITV4 was not live on screen when I went into the recording, and it was fine. I could start at the beginning. So think it is to do with buffering on live channel cancelling out recording history buffer. Very annoying but at least I know how to avoid it. Had the same problem. Because of the failed recording issue, I had to record a repeat. Checked that the recording had actually started on time, but, the next day, I found that the first 20 minutes or so had disappeared. Programme was The 100, channel E4, Thursday 26 July, start time 03.00 (don't sleep well in this heat ). Hello @JaneV and welcome to the forum. The issue you have is different to the one reported here and has been covered in depth in this thread. The good news is that a fix is already being rolled out to some box variants, and I believe the fix for the T2000 retail box will be released imminently. For anyone who's experiencing the same issue, can you let me know if your box software has updated since this last happened and if you think there's any changes or improvements? Our team are currently investigating whether it is linked to the failed recordings issue which has been fixed with the latest software updates or if it's a separate thing on it's own. If there's any other programmes this has been happening with please also let us know these so we can test. I've been having this problem for a number of months now and just came across this thread this morning. I experienced this problem again last night as follows. 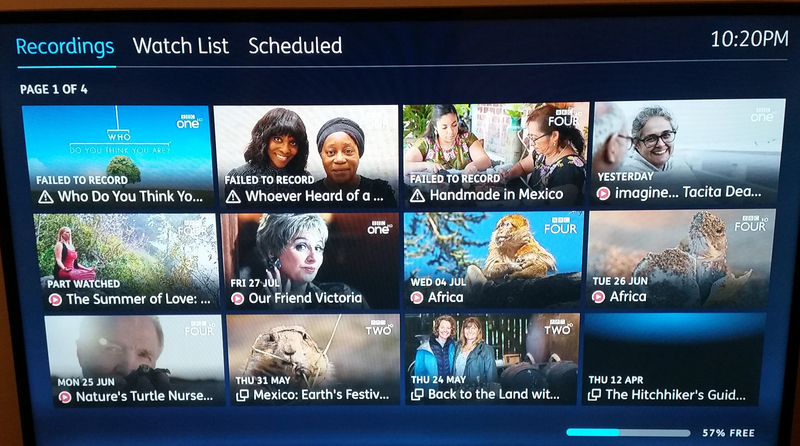 The YouView box was scheduled to simultaneously record two one-hour programmes from BBC One HD and TLC HD. 15 minutes into those recordings, I attempted playback of the BBC One HD recording, resulting in the first 15 minutes of that recording being lost. I did not attempt playback of the TLC HD recording while the recording was in progress. The first 15 minutes of the BBC One HD recording remains missing from my box. The TLC HD recording is for the complete hour as expected, which proves that the box came out of standby to begin the recording. Therefore it would appear that this problem is not resolved by that version. Thanks for providing this explanation of what happened with your recordings. It'd be interesting to know if you still experience this issue with other recordings from today onwards if you are able to test this at some point. Your box updates overnight so it is possible that your box was on a different version last night to what it was this morning. If you happen to have the time to check this it'd be really helpful for our team to know. Of course if you do test this, don't do this on an important recording in case you lose the first section of it. This dilemma illustrates the importance of showing when the latest update was actually received, instead of - or as well as - just the last time it was checked for. Indeed. The last update check date/time which is displayed is redundant information as it happens every day anyway. Previously, it showed the date and time of the last update, which is useful. I could not reproduce the problem on 29.58.0. Now updated to 31.28.0 - all OK.